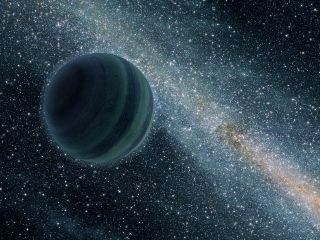 An artist's conception of a free-floating gas giant. Rocky, Mars-size planets may drift between stars with no sun of their own, thanks to their boisterous gas-giant siblings. New research suggests that if gas giants about the size of Jupiter form with an orbit that is also about the size of Jupiter's current path around the sun, each of those planets could hurl an average of eight small, rocky worlds from their system. That would leave the expelled planets to wander alone through the darkness of space, the researchers said. Jupiter is often described as shielding Earth from an onslaught of debris from the outer solar system. But the new research shows that early in its life, when planets were still forming, it may have been a different story. During a solar system's first tens of millions of years, gas giants in distant orbits could potentially hurl smaller, growing planets out of the systems. Along with several moon-size bodies, several worlds similar in size to Mars (whose diameter is a little more than half that of Earth) also might have been cast aside, the researchers said in the new study. "We predict that free-floating Mars-mass planets are exceptionally common," Barclay said. "Our simulations show that at least eight should be ejected from every star, provided that star has a giant planet." After a star forms out of a cloud of gas and dust, planets are born from the material left behind. Previous studies have shown that thousands of planet cores form first. Gas giants must gather their atmospheres onto the cores before the gas evaporates, requiring a quick formation in the first tens of millions of years. Smaller rocky worlds, such as Earth, take longer to grow — closer to 100 million years — and impacts by other space rocks play a significant role in their growth. In the crowd of gas and dust, more baby planets form than manage to grow to adulthood. Previous simulations show that some embryos crash into their siblings and merge or break apart; such a collision is thought to have formed Earth's moon. Others suffer a fiery death as they hurl toward their star. Still others are cast out completely into the darkness of space. Barclay and his colleagues modeled the formation of planetary systems with and without massive giants far from their star. In their chaotic youth, the orbits of the growing worlds crossed one another. When a gas giant far from its star crossed paths with the embryos, it hurled the baby planets completely out of the system. Because of the time Earth-size worlds take to develop, only Mars-size and smaller bodies were cast out. "With Jupiter at its current orbit around a sun-like star, we found that its influence could perturb material out of the system while the bodies were still small," study co-author Elisa Quintana, an exoplanet scientist at NASA Ames Research Center, told Space.com by email. By the time they reached their full size, the Earth-size worlds were on widely spaced orbits and well behaved, Quintana said. "There weren't any major forces powerful enough to kick them out of the system," she said. The research, which will be published in The Astrophysical Journal, was presented this month at the American Astronomical Society's Division for Planetary Sciences annual meeting in Pasadena, California. Although it can be challenging to detect worlds that drift between stars, it's not impossible. Several such worlds already have been identified using a technique known as microlensing. When a free-floating planet drifts between Earth and a star, the gravity of the planet can cause the light to take a slightly curved path, and reveal the tiny world. NASA's Wide Field Infrared Survey Telescope (WFIRST), scheduled to launch in the mid-2020s, should be able to reveal tens of free-floating, Mars-size worlds, Barclay said, although the exact number depends on how common Jupiter-like worlds are. Based on planet-hunting surveys, scientists estimate that only about 10 percent of sun-like stars and smaller M-dwarfs — dim stars that make up an estimated 75 percent of the stars in the galaxy — have a gas giant orbiting at distances similar to those in Earth's solar system. Quintana pointed out that the estimates were based on the worlds already observed, so any biases would play a significant role in these estimates. NASA's Kepler spacecraft, which provided the bulk of exoplanet candidates, spent only four years searching for data. In comparison, Jupiter takes 11 years to circle the sun, and other gas giants in the outer half of their systems could take a similar amount of time. Gas giants that didn't pass between Earth and their star during Kepler's survey would have gone undiscovered. "We predict that WFIRST will detect several tens of Mars-mass free-floating planets," Barclay said. "This is on the assumption that Jupiter-like planets are uncommon. If Jupiters are very common, our predictions go up accordingly." In addition to rocky worlds, WFIRST also should be able to identify more massive gas giants bereft of their stars. Previous research suggests that free-floating worlds may be more prevalent than planets orbiting suns. Among Earth's neighbors, Mars has attracted the most attention for its potential to host life, despite its thin atmosphere. High levels of radiation from the sun lead many scientists to suggest that, if life exists on the Red Planet, it could take shelter underground. Such life would have to take energy from sources other than the sun. Does that mean life could exist beneath the surface of a free-floating Mars-size world? Both Barclay and Quintana said it's unlikely but not necessarily impossible. "Life on Earth took about 1 billion years to appear," Barclay said. "Given that these planets are ejected early, it seems unlikely that any life would have formed if it followed Earth's history." But "never say never," he added. "I would think that being in space without an energy heat source like a star would be detrimental to any life," Quintana said. The tiny tardigrade survives extreme conditions on Earth and could be similar to life that might thrive on free-floating worlds. At the same time, she pointed to hardy, water-dwelling tardigrades, also known as water bears, which can withstand extreme temperatures, pressures and radiation. A handful even survived a short trip in the vacuum of space. These microscopic creatures have been found in some of the most extreme conditions on Earth. "Then again, we have these strange water bears that seem to be super-resilient, so I don't think we can rule out life on anything," she said.